The first time Jeff Dawson showed off his newly built miniature car in action, he got a big reaction from his audience. After all, it wasn’t just a robotic car: it was a robotic car being “driven” by a small flying locust. Bystanders stood in awe as they watched the insect and its vehicle zoom across the meeting room floor. Since that demonstration, at a neurobiology conference in 2000, Dawson has thought a lot about the potential of using insects to control simple machines. He has used his locust car as a tool for teaching university students how locusts fly and use their sensory-motor abilities for getting around. To turn an ordinary locust into a locust driver, electrodes are implanted into the locust’s flight steering muscles, called the M97. Because insects have hard exo skeletons, it’s easy to locate the M97, then poke a small copper wire electrode, held by melted wax, into the muscles. The electrode conveys impulses to a microprocessor on the car, whose wheels individually reproduce the speed and direction generated by the locust’s wings. The result – a locust-steered car – functions like a travelling laboratory that the insect carts around beneath it. Created for fun in 2000, the car developed out of Dawson’s PhD research at Queen’s in the biology lab of Professor Mel Robertson, where Dawson first identified the importance of different muscles for controlled steering during flight. Dawson created the car along with his friend Ron Harding after they were inspired by an article in Discover about a Mothmobile, a moth-driven car, the brainchild of then-bioengineering student Steven Bathiche at the University of Washington. Dawson and Harding imagined that, by swapping locusts for moths, the duo could create a Mothmobile spinoff that could provide unique insight into how locusts fly. Unlike other model insects ordinarily used in flight experiments, such as fruit flies and hawk-moths, locusts can’t hover. This makes studying locust flight particularly challenging. The car makes it possible to gather data on locust flight while allowing the locust to fly forward. 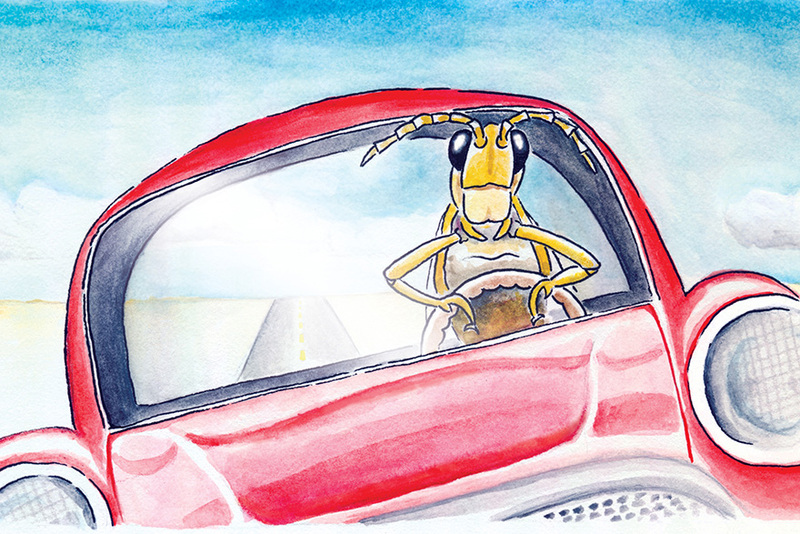 Although 17 years ago Dawson thought the car might be a good tool for understanding flight, the locust car project has since taken him in a new direction. 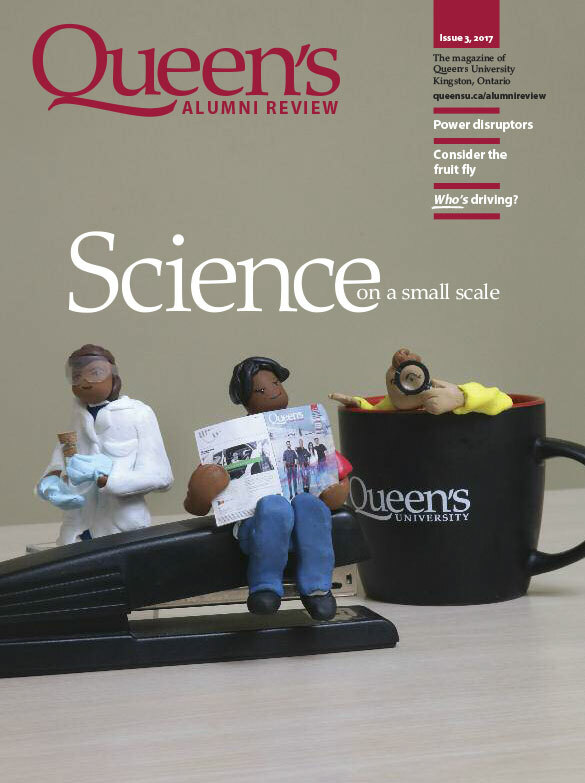 Now, the biology professor at Carleton University sees the locust car’s main benefit as a teaching tool, to allow his students to gain insight into important concepts in neurobiology, engineering, neural-machine interfacing, and signal processing. In using the locust car, Dawson’s students are able to glimpse a simplified version of what goes on with human muscles. Like humans, locusts have fast twitch muscles, very similar in physiology to the muscles we rely on for everyday voluntary activity. This means that when a locust contracts its muscles, the mechanisms that whir into action – the release of neurotransmitters, cycling of calcium, occurrence of action potentials – parallel those that play out in human muscles. However, in comparison to a human’s muscle, a locust’s neuromuscular system has far fewer components, which means there are fewer signals muddying up the reading. This makes it easier to understand general principles of biology. In 2012, one of Dawson’s students, Kevin Mai, took advantage of the locust’s relative simplicity to conduct a project that explored locust vision. The car-driving locust was implanted with an additional electrode that could record activity from a visual neuron that detects movement. Then he sent a Styrofoam sphere painted to look like a soccer ball slowly down a metal track toward the locust car and was able to find out what the locust’s eyes were doing as the insect dodged the ball – or didn’t. “We had quite a few collisions,” Dawson admits, which he attributes to the inability of the car to respond in time rather than to any of the insect’s shortcomings. The locust car itself, though, hasn’t seen much activity of late – it currently sits in a trunk in the back of Dawson’s lab. Since he finds students are most engaged with a project when the impetus for their work emerges from their own personal interest, he doesn’t assign students locust car experiments. And it just so happens that, in the past few years, Dawson’s students have elected to focus their energies elsewhere. But that hasn’t swayed Dawson’s belief in the locust car as a powerful teaching tool. “I’m just waiting for a student to come up and tap me on the shoulder and say, ‘Hey Jeff, I really like biorobotics. Is there anything I could do in your lab that would teach me about this?’ And then he will get the locust car out, ready for another spin. Learn more about Dr. Dawson’s work and see what the locust car actually looks like….